When I was ten years old I spent an entire summer teaching myself how to french braid my own hair and how to do a handstand. This was either a sign that my parents really should have sent me to camp, or I was savvy enough to know that braids would be all the rage when I was old and thirty. Either way, I win, although I still stink at handstands. I love the look of a braided headband, but the first few times I did it I got frustrated with how much it slid around as well as how difficult it was to get the headband to stay against my head. No matter how many pins I used it always poufed up away from my head. I finally got wise a started doing it this way. Ugly hair is the mother of invention. 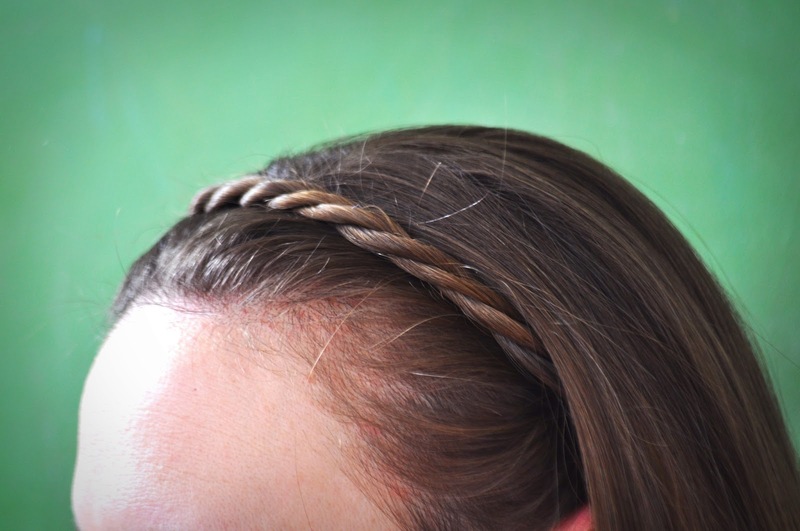 This tutorial isn't a french braid, but anyone who knows how to do a french braid will find the steps for this stay-put version of the popular braided headband familiar. All you need for this tutorial is a polyband (those small, clear hair rubber bands that look like they could go on your braces) or a small hair elastic. Ta da! You can either wear your hair down or pulled back in a pony or bun. One of these days I'll get crazy and do the braided head band with the donut bun. You could also try one of these double plaits, a la Jessica Alba. Also, be honest - am I nuts or do I see my first grey strand in the first pic? Please tell me it's blonde. UPDATE: If you're looking for more headband styles, check out the rope braid headband tutorial, which you can find here. cute! I'm going to try this today. thanks for sharing that. and you're crazy, i see no gray hairs. oh fab. send pics. If I have enough time in the morning I may try for the double braid...we'll see. and thanks for the no gray vote. its only a matter of time, but i'm strangely obsessed with how long i can go until i spot one! And I don't see the gray hair ha, I think the light hit a strand and is making it look light! That happens to me in some of my pictures, its strange! Thanks Angela! I think even when they are grey I'll still try to pass them off as blonde :). Thanks for following....we're glad to have you! Awesome! I love this look. I'll have to give it a go when my hair gets a little longer. I chopped it off for the new year and want it back!! Haha, I do that all the time - cut off my hair and then grow it back out. The grass is always greener! Yes! Thanks for the tips...did this successfully today! Oh yay! That's great! Hope it was easy to follow! Totally blonde :) What a cute and easy idea! You definitely must try it with a donut (or, in my case, sock) bun! 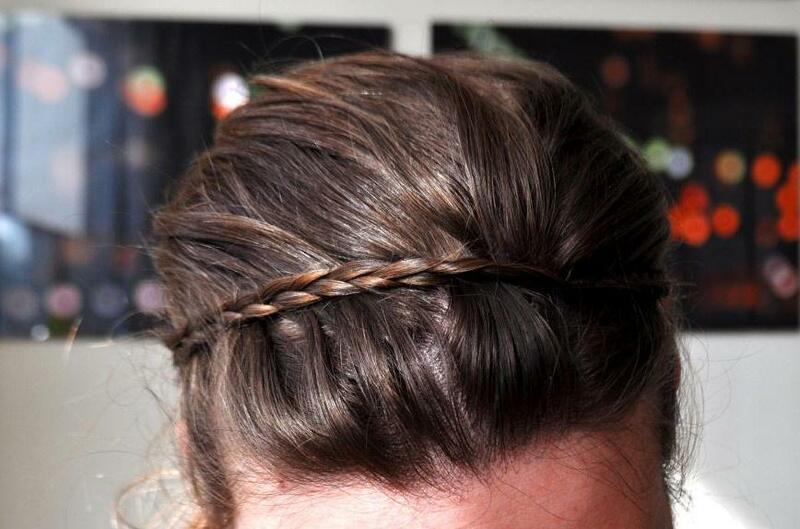 The braid would be such a great way to dress up an already-chic style, especially if you can pull it off with no bangs. You must post pics when you get around to it ;) Thanks for the tutorial! Hi Tamara, yes the donut + headband is still on my radar! Just need to find the time and occasion for it :) hope you enjoy! ditto! although I have lots of hair, it's very fine, so every 15 minutes i was re-attaching my braid. it wasn't a cute look. so glad to share this one with you! let me know how it goes! Thanks so much for sharing, couldn't resist trying immediately and it turned out beautiful! I am no braiding expert unfortunately but this was easy and made so much sense....LOVE IT! Thanks again! Wow.. thanks for sharing this. I am impressed! now i know what to do with in our gray hair reversal. urgh... why is this so difficult for me? it may take a try or two depending on how comfortable you are with braiding. the way i described it to a friend was that you want to "anchor" your braid to your head. the way you do that is by picking up a little piece of hair right where you want to "anchor" your braid, and incorporate that little piece into the braid. the trick is to pull it tight enough that it lays flat and look seamless. give it another go! Love this - I hate having to bobby pin mine down because like you said - by the end of the day mine are all over the place. Will definitely be trying this next time! This is amazing, I love it! You make it look sooo easy too. I need to try it!! Can you make a video of this??? I love the pictures but a video would be great! Trying this out for new years eve! My daughter is a hairband fanatic...this is something that she's going to love! Thanks for sharing! So cute! I am trying this out on my daughter in the morning. Thanks for sharing! No way thats gray hair! And I'm totally IN LOVE with your hairstyles! I'm sooo gonna have to try some of these!!! !